Perth is a city brimming with creative souls and when one or two of these west coast natives collaborate on a shoot we are always delighted to see the outcome. So imagine our excitement when we heard half a dozen of them had gotten together to create a styled shoot inspired by one of life’s simplest pleasures – the humble backyard gathering. Small celebrations made up of big laughs, great friends and fine food? what more could you ask for on your wedding day. This shoot, created to serve as inspiration for brides and grooms to-be, was the brain child of Nectarine Photography’s Loren Ioppolo (Perth brides write that name down, she is a bit awesome) and Pilgrim Styling‘s Stacey, an event designer with quite the knack for putting together small, intimate gatherings. These lovely ladies teamed up with some of their favourite West Australian vendors like the incredible Bec from Fox & Rabbit. Bec whipped up some fetching berry inspired floral arrangements for the reception details and some white, cream and green bundles of joy for the brides bouquet. Look out baby’s breath, ferns are making a comeback and you heard it here first! 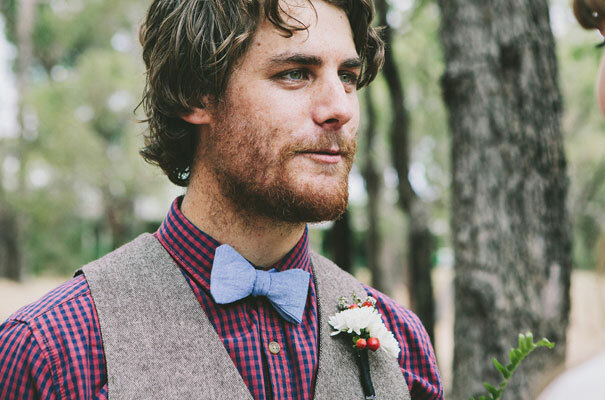 We love the boys’ handmade bow ties by Mkay and the eclectic vibe of the mismatched vintage china from The Vintage Table. Owner Alison tells us, “I insist that everything is genuinely vintage and there are no modern copies or reproductions.” The phrases vintage inspired’ or vintage-style’ are simply not in Alison’s vocabulary so you can rest assured that when you hire from The Vintage Table you are getting the real deal. And what’s a backyard wedding with out some good old fashion lawn games thanks to Her Handpicked Harvest. Nothing beats clowning around with your mates with a cold drink in one hand and a bocce ball in the other but the best accessory of all? The company of those you love. CREDITS Photos Nectarine Photography // Styling Pilgrim Styling // Flowers Fox & Rabbit // Vintage furniture and lawn games Her Handpicked Harvest // Vintage china and tableware The Vintage Table // Bow ties Mkay.